CNC 12-axis machining centre, designed to perform milling, drilling and cutting operations aluminium and light alloys in general. QUADRA L1 is made up of an automatic tool magazine and a thrust feed system for profi les sized up to 7500 mm complete with profi le clamping gripper drive. Due to the movement of the collet, the feeder returns to its initial position thus allowing the loader to prepare the next profi le at the same time. In the central part are situated the milling module and the cutting module. The CNC 4-axis milling module is equipped with 4 up to 6 electrospindles and enables the whole contour of the workpiece to be machined, however it is oriented. 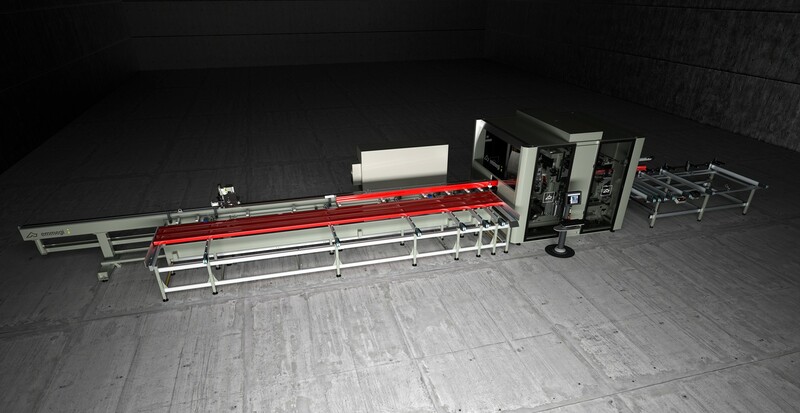 The CNC 3-axis cutting module is made up of a Ø 600 mm blade, with down stroking movement. 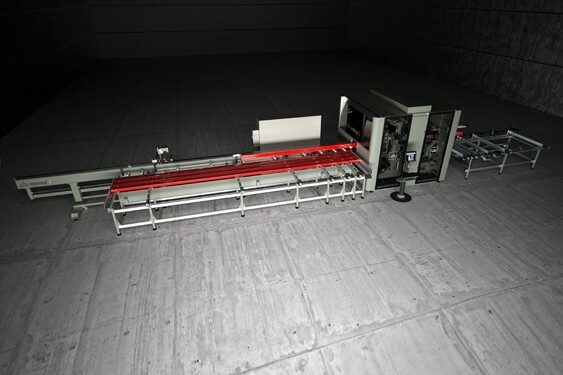 QUADRA L1 also comprises an automatic outfeed unit leading from the cutting unit to the unloading magazine. The unit is made up of a magazine with transverse belts for unloading machined workpieces with a length of up to 4000 mm (7500 mm optional). The machining unit can be fi tted with a cabin (optional) soundproofi ng the central operational part, which not only protects the operator but also reduces the acoustic impact on the environment.